Economical & versatile for a multitude of products & applications. 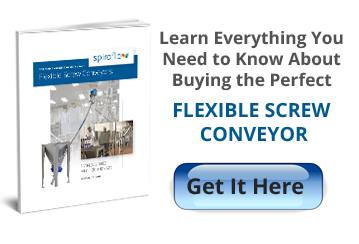 Spiroflow Flexible Screw Conveyors are just that – flexible! They can convey in any direction from horizontal to vertical, routed around fixed obstacles and equipment, and from one room to another. They are ideal for lifting materials from bag dump stations or storage bins and conveying products at ceiling height to feed a line of processing or packaging machines – as multiple discharge points can be placed along horizontal sections. Spiroflow’s Flexible Screw Conveyors inherently ensure material is constantly being remixed. This is accomplished through the action of the rotating spiral – effectively eliminating the risk of product segregation. Flexible Screw Conveyors are also an extremely cost effective method of conveying dry bulk solids and ingredients! Flexible Screw Conveyors are called by many different names, including a flexible auger, flexible screw conveyor, flex conveyor, flexible spiral conveyor, helix or helical conveyor. The rotating flexible screw conveyor spiral, centralized within the conveying tube, gently moves material without degrading it. Its unique action also eliminates the risk of mixed product separation. The simplicity of operation is the key element in the Spiroflow flexible spiral conveying system. The electric motor driven spiral, the only moving part, rotates within a sealed tube, moving the materials along by its Archimedean screw action. This design simplicity eliminates the need for additional operating equipment such as filters or bearings – all adding up to a system that’s hygienic, easy to clean, low on installation and maintenance costs and high on efficiency and performance. The Spiroflow flexible screw conveyor is totally sealed during operation. Because air isn’t used as a conveying medium, there’s no risk of dust contamination or humidity from the atmosphere, a critical factor when used in food and pharmaceutical applications. Additionally, dust can cause airborne contamination of other products and also pose a threat to the working environment. The simplicity of the Spiroflow flexible screw conveyor system makes cleaning a simple operation. The electric motor may be reversed to empty the conveyor of residual material. It can then be flushed out with water or cleaning solution. If necessary, the spiral can be quickly removed from the tube, and optional quick release connectors enable rapid dismantling and reassembly to minimize downtime. A robust inner spiral is the only moving part of a Spiroflow flexible screw conveyor which ensures trouble-free operation. The action of the Spiroflow flexible screw conveyor ensures the material is being constantly remixed. This is particularly important when feeding premixed product to packaging and tablet machinery. We offer heavy-duty screw conveyors with Ultra High Molecular Weight Polyethylene (UHMWPE) tubes for abrasive or high bulk density materials. For the most abrasive metals, aggregates and materials such as glass cullet, we offer our RHINOVEYOR Flexible Screw Conveyor which has an abrasion resistant rubber conveying tube in addition to a heavy-duty spiral. Tests and operational experience have confirmed that our RHINOVEYOR conveying tubes have a significantly longer life than standard UHMWPE plastic tubes in aggressive applications. Because of their versatility and ability to handle a wide range of particle sizes, bulk densities, and flow properties, Spiroflow flexible screw conveyors are installed around the world in a multitude of industries. Hygienic ingredients handling is a fundamental benefit of Spiroflow equipment, designed to satisfy the stringent sanitary demands of the food and allied industries. Spiroflow supplies efficient dosing equipment for hydrated lime, activated carbon, and other chemicals used in water treatment. Spiroflow’s long experience within the chemicals industry ensures the safe handling and accurate metering of these often hazardous materials. No bulk handling tasks are more arduous than in minerals and ceramics. Spiroflow equipment is robustly built to meet the most exacting demands. Spiroflow solids handling equipment is widely chosen to ensure efficient feeding of molding, extrusion and mixing machinery in the volume manufacturing sectors. Accuracy, hygiene, and consistent feeding are prime requirements in the pharmaceutical field. * Throughput rates vary depending on bulk density, material flow characteristics and length and elevation of the conveyor. We recommend material testing to determine the correct model. Inlets can be fitted with baffles, lids, hoppers, agitators, etc. Custom designs available. For most applications, the standard round spiral is suitable, combining strength and flexibility. Flat section spirals are recommended for certain light or aerated products. The Proscrew beveled profile is used for conveying difficult materials such as iron oxide. The semi-rigid construction enables steep conveying angles to be achieved without bends. The Centre Core is used for very light materials that fluidize readily and for conveyors inclined more than 60°. They are also used to prevent flooding/overfeeding of certain solids in short or horizontal conveyors. All spirals are heat treated to provide strength and long life. Heavy duty spirals are also available for certain high density or aggressive materials. Flexible screw conveyor tubes are available in UHMWPE, carbon steel (mild steel), 304 stainless steel or the industry’s only ‘Rhinoveyor’ rubber tubing (used when conveying abrasive material). Drive Motor Motor: Selected based on application requirements. Typically 2-7.5 hp/ 1.5-5.6 kW. Controls: Motor starter, controls by customer or see options. Hopper Bag Slitting Shelf This work shelf is mounted to the side of our feed hoppers. Hopper Cover This is designed to fit the feed hopper and is supplied complete with a dust vent and sock. Dust Hood This Carbon steel (mild steel) or 304 stainless steel hood is designed to fit our range of feed hoppers and is supplied with a plastic access curtain and vent connection. Solimar Air Pads Includes air pads, all necessary plumbing, an air regulator and a timer board. Inlet Vibration Inlet vibration is used to aid the flow of materials that can bridge in the hopper. Agitation Used to promote the flow of materials and break up any soft agglomerates before entering the conveyor. Motor starter, controls by customer or upon request. Drop Out Box A drop out box (also called a ‘drop trap’) enables easy access for cleaning. Hand knobs are supplied and eliminate the need for tools. A safety switch ensures that the system cannot be operated with the cover removed. Reversing Trap A removable end cap on the inlet of the flexible screw conveyor allows for the maximum recovery of un-used product. An operator can run the spiral in reverse prior to product changeover to emptying the system. A safety switch ensures that the system cannot be operated with the cover removed. Quick Release Tube Connections Quick release tube connections facilitate rapid access for dry and wet cleaning of the inside of the convey tube. Hand knobs eliminate the need for tools. Quick Release Outlet Cover A quick release outlet cover facilitates rapid access for cleaning the inside of the outlet housing. We will utilize a proximity switch. Level Sensor A capacitance sensor is mounted through the side of the chute/discharge for indication of low and/or high solids level. Intrinsically Safe Level Sensor A capacitance sensor, suitable for an explosion-proof classified area, is mounted through the side of the chute/discharge for indication of low and/or high solids level. Polished Spiral All product contact weld seams and surfaces to be ground and polished to #4 finish with a 1/32” to ⅛” radius. No weld undercuts are allowed. Pusher Conveyor The drive can be mounted at the inlet instead of the standard discharge location. Sanitary Seal The sanitary seal is comprised of a lip seal and stand-off between the drive and the outlet. Mobile Frame A carbon steel (mild steel) or 304 stainless steel mobile frame support is provided with casters and support for the discharge housing. Right Angle Gear Reducer The motor is positioned at a 90º angle from the discharge. Center Core The center core is a UHMW polyethylene rod that fits inside the length of the spiral. Flexible Discharge Hose Our flexible discharge hose is supplied with a stainless steel hose clamp and is offered in PVC, white neoprene or urethane. For friable plastic waste, hygroscopic product (salt/sugar), chocolate or cracker lumps. Here is an example of a basic bag dump station. This particular bag dump station has a bag support shelf, dust hood, vibration & level probe. Mobile bag dump stations are typically configured with a dust hood and an integral flexible screw conveyor. Multi-way flexible screw conveyors allow up to three conveyors to be fed from a single feed point. The system features swiveling inlet assemblies that allow the conveyors to be quickly installed and positioned as required, giving users valuable operational flexibility. Dry, free-flowing products (sugar, salt, rusk, plastic granules) are fed smoothly and consistently – without the pulsing that occurs with pneumatic systems – allowing ingredients and additives to be metered to processing and packaging machines. Often, companies needing to improve their production processes, reduce dust or eliminate manual handling just do not have the capital expenditure budget to upgrade the feed systems to a multiplicity of individual machines. At Spiroflow, we can supply mobile flexible screw conveyors for dry ingredients with or without an integral dust hood as a cost-effective answer to feeding several machines. Operators can either load the conveyor direct from small sacks or wheel the mobile unit with a suitably sized collection hopper under a silo, mixer or process vessel. Alternatively, as the photo shows, our mobile conveyors can be furnished with an integral bulk bag unloader. Mobile, easy to clean flexible screw conveyors can help solve ingredients handling problems within a short pay-back period. Thorough mixing is achieved over a short length of material flow with Spiroflow’s Inline Twin Screw (ITS) continuous proportional blender. It is steplessly adjustable for any blend ratio and is designed for use with any free free-flowing, granular, flake or pelleted materials. Accuracy of the Spiroflow ITS is to 2%, depending on material and application, making it suitable for a wide range of uses in the food, chemical, building products and other process industries specifications. The Spiroflow ITS incorporates a novel principle in that the feed of the secondary ingredient is introduced directly into the center of the flow of the primary ingredient. The unit has two rotating spiral type conveyors of different diameters. The steel tube of the smaller conveyor is located within the spiral of the other. As the diagram shows, the tube of the smaller conveyor extends beyond the inlet hopper of the larger conveyor. This ensures that the flow of the minor ingredient is introduced into the primary one at the optimum point for thorough mixing. Stratification of different ingredients, which occurs with other types of mixer, is avoided by the unique design of the Spiroflow ITS due to its mechanical action. Spiroflow ITS blenders are made up of standard sized Spiroflow rotating spiral conveyors and can be designed for any required throughput up to a maximum of 10 tph. Hygienic versions of the Spiroflow ITS with quick release connectors for ease of disassembly and cleaning are available for use in the food, chemical and pharmaceutical industries. Mix quality can equal that of more expensive batch equipment. Little or no particle breakdown during mixing even on friable materials. Short process length minimizes the size of the unit, saving floor space or simplifying overhead installation. The mixture is conveyed and continuously mixed for approximately 3 feet (.9m) by the larger spiral to the discharge outlet. Can be used effectively with two or more components of similar or greatly differing particulate size and density. Flexible screw conveyors can transport a multitude of materials. Here is a list of materials generally considered for this type of conveyor. Our engineers will carefully assess the properties of your material and likely perform a material test to ensure your conveyor performs exactly to your expectations.